IBS can be really troubling health issue. Anyone who suffers from IBS will understand how annoying it is, heavy bloating and discomfort after almost every damn meal. If you are one of them the you should meet our experts at Welling Clinics for a detailed assessment and for our specially formulated Homeopathy treatment for IBS. We’ve heard before that cutting certain foods out of your diet won’t necessarily help to stop IBS. It’s important to understand that IBS can cause different symptoms for different people. Sufferers can react to different foods so there is no one-size-fits-all diet when it comes to IBS. If you’ve got a sensitive gut, the chances are you’ll react to most foods, but keeping a food diary is the best way to work out by process of elimination which ones might flare up your IBS more than others. Not everyone will react to every food on the list below advising people not to cut out everything because that could leave you eating a very restrictive diet. Onions have been singled out because of how gassy they are, but they aren’t the only veg that’s guilty of that – cauliflower and Brussels sprouts are too. 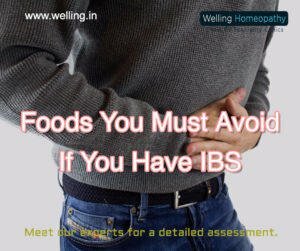 The issues arise because some IBS sufferers have difficulty fully digesting these foods, meaning they pass into the large bowel where they are digested by the bacteria that we all have living in bowel. A by- product of this digestion is gas, which can cause bloating and pain. This one’s probably kind of obvious. It’s well known that chilli can irritate the lining of the gut, but it also speeds up gut transit time, increasing the risk of diarrhoea and pain. Fizzy drinks = gas. Gas = an increased risk of bloating. That’s just how it is, unfortunately. High fibre foods are notorious for getting your bowels moving, which is good in most instances, but not always if you’ve got IBS. Lentils, baked beans, wholemeal bread and wholegrain cereals are all examples of high fibre foods, for some IBS sufferers, a high fibre diet can help ease symptoms like constipation, but for others high fibre foods can be a trigger because they can irritate the gut lining and can be difficult to digest. For this reason, the nutritionist advises to introduce more fibrous foods into your diet gradually if you’re currently eating a relatively low fibre diet – it’ll give your body time to adapt. It might feel harmless, chewing a bit of sugar-free gum, but this can be one of the worst culprits for causing someone to bloat and experience IBS symptoms. This is because sugar-free sweets and gum often contain sorbitol or other sugar substitutes which people with IBS find hard to digest. Alcohol can irritate the lining of the gut and affect motility (an organism’s ability to move food through its digestive tract) as well as the permeability of the gut lining. She advised sufferers to avoid alcohol if possible, or to limit your intake to no more than 2 units a day, while ensuring you have at least 2 alcohol free days a week. They might be the tastiest, but high fat meals (think cheesy goodness, basically) can slow down gut motility and reduce the body’s ability to get rid of gas. That means it builds up in the digestive tract, causing bloating and pain. You might rely on your daily coffee like it’s oxygen, but caffeine can be a no-no for some IBS sufferers. The reason being, caffeine causes increase in gastric acid secretion, which can have a laxative effect. If you’re affected in this way, the nutritionist advises limiting your intake of caffeinated drinks to no more than 3 cups (or 2 mugs) day, and reminds us that caffeine can also be found in plain chocolate, energy drinks and cold remedies. Milk and dairy products contain a type of sugar called lactose which needs to be broken down by the enzyme lactase before it can be absorbed. But when a person’s gut lining is damaged, it’s common to lose the ability to produce lactase which means that the body can’t digest or absorb lactose. This, in turn, means it passes into the large bowel – much like what happens with veg like onions and cauliflower – where the bacteria digesting it produces gas. If you’re none-the-wiser about what FODMAPs are, they’re “foods which contain fermentable oligosaccharides, disaccharides, monosaccharides and polyols”. Still no clue? They include garlic, bananas, wheat, apples and more. Remember, just because a particular food or food group might cause your IBS to flare up, doesn’t mean you have an allergy to it – that’s a different thing entirely. But eliminating or reducing certain foods your gut is sensitive to could be one way to reduce the effects of IBS in your everyday life. Eat regularly: Have three small meals with a couple of healthy snacks between. Skipping meals and leaving long gaps between meals can affect gut mobility, making it sluggish and increasing the risk of constipation. One study found that subjects with irregular eating habits were 3.2 times more likely to suffer from IBS than those with regular eating habits. Avoid large/heavy meals: This can overload the gut, increasing the risk of bloating and diarrhoea. IBS is between 2-4 times more common in binge eaters. Visit Welling Clinics for the specially formulated Homeopathy treatment for IBS. It can help you recover completely and permanently. ← Back pain: YOU could be suffering from THESE diseases.